ArcSegment is the basic shape which consists of 2 arcs and 2 lines connecting them. As there is no easy fill method I just paint an ellipse over the inner element. To draw the lines for connecting the arcs I used a PVector and Shiffmans method to rotate the PVector object. To detect a mouseOver I used the mag() and angleBetween() functions of PVector. This class will create a ring based on the start and end points. It will take a value, a label and a color for each segment of the ring and divide them accordingly based on the values. 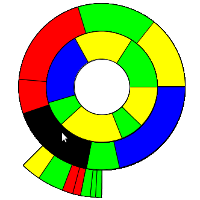 The Value, Label and Color ArrayLists are set in the Ring class and the ring is created by creating the segments. Each Ring contains the start angle, end angle and the values. The RingChart Class puts it all together, it’s the class that will be called from the application. It takes a ArrayList of type Ring and does all the rendering looping through the draw() method of each ring and and each of their segments. You can download the full sources, including the example shown above, at OpenProcessing. This entry was posted on Friday, August 10th, 2012 at 11:53 am	and is filed under software. You can follow any responses to this entry through the RSS 2.0 feed. You can leave a response, or trackback from your own site.